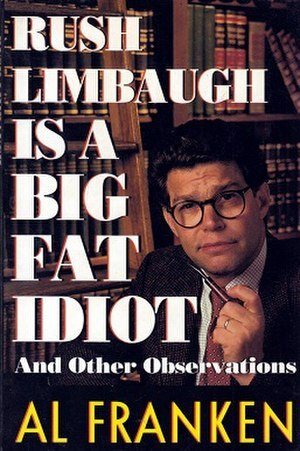 Rush Limbaugh is a Big Fat Idiot, and Other Observations by Al Franken. Last evening on The Last word on MSNBC, Howard Dean mentioned this book and then I remembered that I had read it a few years ago. I refreshed my memory this morning and this is what I found. The book is a satirical collection of 45 short essays on Rush and other topics: Newt Gingrich, Bob Dole, Phil Gramm, Pat Buchanan, Ross Perot and assorted other politicians. The book was published in 1996, before Franken became an US Senator. He listed the problems facing the 99% then and they have not changed in the 16 years since the book was published. This is a quotation from the Epilogue. “We are all living in a wildly more complicated world than we were born into. And at the same time the trust in our institutions, in government, in family, in individuals, is eroding. And lack of trust creates fear, and fear creates anger.